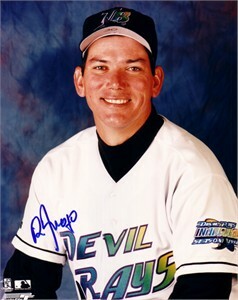 Tampa Bay Devil Rays 8x10 photo autographed by 1998 American League Rookie of the Year runner-up Rolando Arrojo, who made the All-Star Team that season. ONLY ONE OF THIS POSE AVAILABLE FOR SALE. With certificate of authenticity from AutographsForSale.com.